Strength is in the design  exclusive 500 lb. capacity adjustable steel shelves. 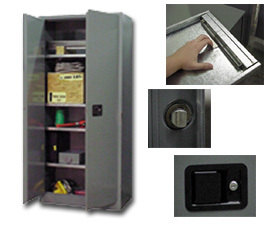 This rugged cabinet is all welded, 18 ga. steel construction throughout and provides years of service for heavy tools and equipment. Full width double wall cabinet doors feature full length piano hinges and a lockable flush mounted door handle for obstruction free, finger tip operation. 3-point self latching doors on all models. Shipped fully assembled and ready to use. Available in Beige or Gray – please specify. FOB Shipping Point.